During the event, the exhibition showcased the various colleges and departments of service at QU. High school students and their parents from both female and male schools in Qatar discovered opportunities and got a first-hand feel for university life at Qatar University’s (QU) ‘Open House Day’. The three-day event was organised by the Student Activity and Orientation Department in QU from February 18 to 20, with the first day dedicated to male secondary schools and international schools, and the remaining two days allocated to girls’ schools. 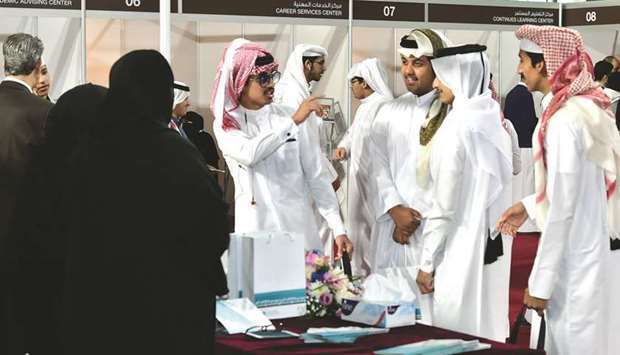 During the event, exhibitions showcased the various colleges and departments of service at QU, thereby displaying to high school students and their guardians the wide variety of specialisations available at the university and the conditions of acceptance. The ‘Open House Day’ “embodies one of the university’s most important messages to connect with the outside community and to attract as many national students as possible to qualify them to participate in the country’s labour market after graduation”, the statement notes. All secondary schools in the country, including private schools for boys and girls, were invited to attend as well as international schools, in order to benefit from all the services that are provided. During the event, the app for the ‘Qarari campaign’ was shared. This is a mobile application that raises awareness among youth of the importance of selecting majors that fit their literary and scientific preferences.